I would like to introduce you all to a friend and partner who I hope can help you with your future graphic design needs. My friend Jennifer has started her own business Element 120 Designs which is a local, full service graphic design company that specializes in personalized photo card and greeting card templates. What sets them apart from larger design firms is their dedication to create the perfect design for you. Their clients are much more than just a number and their designs allow a family to share the first beautiful impression of their newborn, transform a birthday invitation into a keepsake, or allow a bride and groom to announce their wedding date in style. They love design and know that personalized design has made the special events in your lives all the more special! Please take a moment to view their template designs at www.element120designs.com. 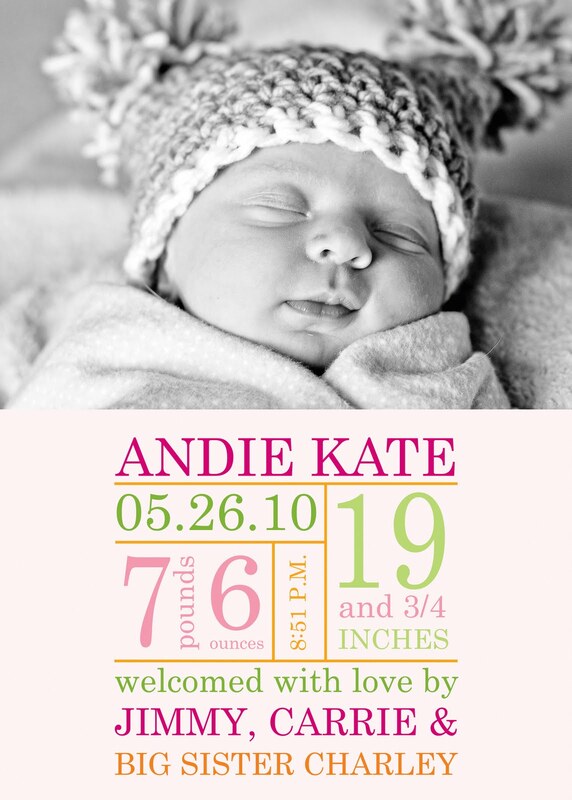 Jen at Element 120 Designs made Andie's birth announcements for us...and we loved them! Here is Andie's announcement - I even wanted to use 2 different pictures with 2 different layouts and she made both for us! Stay tuned in the next week for a big announcement from Carrie D Photography and Element 120 Designs! Our partnership is going to help make your holidays a little merrier and hopefully a little simpler too!